Thank you for your interest in becoming a foster or adoptive parent. The willingness of people like you to help Arizona's children is part of what makes our State great! The first step is to view the five-part orientation video series. If you have not yet viewed all five videos, or if you want to watch the videos again, you can find them here. Your next step in the process is to select the licensing agency with whom you wish to work. Remember, you need to select an agency based on the county where you live. You can use this Matrix to find agencies in your county. DCS encourages prospective foster and adoptive parents to interview several licensing agencies before making a final decision. It's important to find an agency with whom you are comfortable because they will be asking you deeply personal questions and will frequently be in your home. As a reminder, here's the link to our tips for selecting an agency. Are you a grandparent and/or great grandparent who is raising your grandchildren through a placement through the Department of Child Safety and you are not currently a licensed foster parent? If so, the state may have a $75 monthly stipend per child. To qualify, a grandparent or great-grandparent must have an income below 200% of the federal poverty level. In addition, they must not be receiving foster care payments for the grandchildren in their care. You can be receiving TANF cash assistance. Grandparents who might qualify should fill out the form with the links below and submit it to their DCS caseworker. 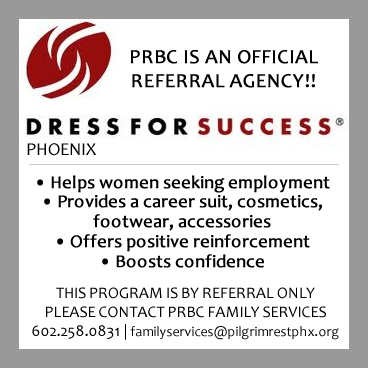 Any additional questions please contact Family Services at familyservices@pilgrimrestphx.org or 602-258-0831. The City of Phoenix Community and Economic Development Department offers two programs designed to help small businesses!! to enhance economic, educational, and social opportunities and strengthen communities. Open Doors Website -Check out our free E-book Opening Doors to a Better Life: 10 Simple Tips and Worksheets to Help You Start Your Journey. community-based organizations, law enforcement agencies, and the everyday stakeholder) in holistic evidence-based services to assist in the successful transitional process of re-entry. If you, a family member, or friend is in need of services please contact family services at familyservices@pilgrimrestphx.org. The Arizona Community Foundation and the Phoenix IDA, along with MariSol Federal Credit Union and Take Charge America have launched a loan program named Lend a Hand. The loan program assists Maricopa County residents who are struggling to pay off high-cost title loans and helps them find a path to healthy credit and financial success. Take Charge America offers applicants a free credit counseling session and helps each applicant develop a budget. MariSol Federal Credit Union then offers qualified applicants an alternative loan with favorable terms and pays off their title loan debt up to $2,000. As part of the program, borrowers establish their own savings accounts with MariSol to help build emergency savings and plan for a secure financial future. The Lend a Hand brochure [PDF, 315KB] provides information about the program and includes an application. You can learn more on the Lend a Hand website CLICK HERE. 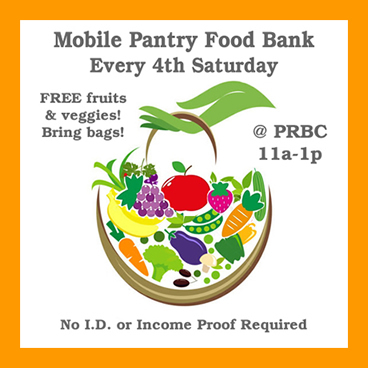 The Mobile Pantry provides FREE fruits & vegetables every 4th Saturday in the PRBC Gym from 11am to 1pm. there is no income or ID required. Remember, this event takes place every 4th Saturday of the month-RAIN or SHINE! Community Information and Referral Services serves as Arizona's key source of integrated information that brings people and services together to meet vital needs. It is our vision that all Arizonans are easily connected to available health and human services in their communities. We are the lead agency and provider of 2-1-1 services in Arizona. Our Community Exchange is a web based system that enables anyone in Maricopa County to seek and share resources. Community Exchange team partners are able to: Send a message throughout our Exchange network requesting assistance in meeting an identified need. Donate physical items and resources to meet the needs of others. Share important announcements and list community events. It is not necessary to sign in to access the directory of community resources under the 'Resources' link. The Community Exchange fosters the belief that people helping people builds a stronger community. The March presentation will provide details about registering for the new e-learning training and assigning required learning plans. Effective April 1, 2017 all HEAplus users from Community Partner organizations will need to take some sort of e-learning training, so please plan to attend. Valle Del Sol Offers Uninsured Children/ Youth Mental Health Services! "Lack of health insurance can be a major barrier to mental health care. A local organization wants to help uninsured kids can get the care they need in 2016." DO YOU HAVE CONCERNS ABOUT LONG-TERM CARE? Options Counseling is an interactive, person-centered process where individuals, family members and/or significant others with an interest and desire to plan for their long-term care needs can find assistance. The Arizona Department of Health Services today issued a notice to approximately 2,500 individuals to let them know of a possible breach of protected health information. The potential breach relates to information collected in the department's Newborn Screening Program for billing purposes. ADHS does not have any indication the information has been accessed or used by an unauthorized individual, however, it will be important for those affected to be vigilant for fraud alerts. ADHS uses Midwest Medical Practice Management Inc., a third-party billing company located in Carbondale, IL, to conduct billing for newborn screening services. To do this, ADHS mails the billing company paperwork that contains the following protected health information for both mother and child: names, dates of birth; addresses; phone numbers; health insurance information; and possibly social security numbers. On April 20, 2017, two parcels of billing documents containing protected health information were shipped by ADHS via the U.S. Postal Service to the billing company with individual tracking numbers assigned by USPS. Only one of the two parcels was delivered to the billing company. The parcel that was not delivered to the billing company included billing documents containing protected health information on patients who have been through our Newborn Screening Program. According to the USPS Tracking site at usps.com, the parcel arrived at the USPS Facility in Phoenix, AZ 85043 on April 20, 2017, at 10:15 p.m. and as of April 22, 2017, at 5:15 a.m. had a status of "[i]n [t]ransit to [d]estination." As of the date of this notice, the parcel has not been located by USPS and is still listed as "[i]n [t]ransit to [d]estination" on usps.com. The USPS does not consider a parcel to be lost until 30 days have passed which was May 24, 2017. Because 30 days have passed since ADHS discovered the parcel had not been delivered to the billing company, ADHS is notifying affected individuals of the potential that their, and/or their child's, protected health information may be compromised. USPS has no records of the parcel being misdelivered or compromised in any way. In addition, there is no indication the parcel has left USPS' custody and the department is hopeful that it will be located as USPS continues to search for the item. As a result of this situation, ADHS is reviewing and evaluating its mailing process for NBS Program records. In addition, ADHS is continuing to work with USPS to determine the location of the parcel and identify what steps can be taken to prevent similar situations from occurring in the future. Affected individuals will be notified by mail. If you have questions on this notification, please contact ADHS by phone at 1-800-548-8381 or email WebPIO@azdhs.gov. Improving the health and economic security of 10 million older adults by 2020. Join the millions of people who have discovered over $18 BILLION in benefits!!! Are you a grandparent and/or great grandparent who is raising your grandchildren through a placement through the Department of Child Safety and you are not currently a licensed foster parent? If so, the state may have a $75 monthly stipend per child. To qualify, a grandparent or great-grandparent must have an income below 200% of the federal poverty level. In addition, they must not be receiving foster care payments for the grandchildren in their care. You can be receiving TANF cash assistance. Grandparents who might qualify should fill out the form with the links below and submit it to their DCS caseworker. Copyright © 2017 Pilgrim Rest Baptist Church. All rights reserved. Site designed by CW Technology Consulting.